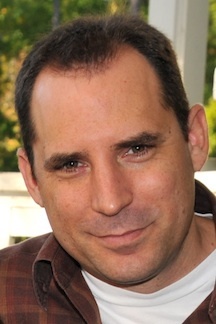 Cris Cohen, CaryCitizen.com's newest columnist. May 3, 2011 (Cary, NC) – The online newspaper CaryCitizen.com has added another dimension to its offerings: a new humor column by Cary resident Cris Cohen. His first column, entitled “A Visit to the Chiropractor,” is online now at www.carycitizen.com. For several years, Cohen wrote a weekly column that ran in several California newspapers. Since he and his family moved to Cary in 2008, he’s been writing a humor blog “Nothing In Particular” at criscohen.typepad.com. He’s also preparing to publish his first book, Staying Crazy To Keep From Going Insane, a collection of his columns that he will use to raise funds for a local baseball league for kids with special needs. This spring, Cohen ran a contest on the blog to celebrate the fact that he received an endorsement for the book from one of his humor-writing heroes, Pulitzer Prize-winner Dave Barry. He invited his readers to submit a guest post for “Nothing In Particular.” The writer with the funniest post would receive a copy of Barry’s newest book I’ll Mature When I’m Dead. As it turned out, CaryCitizen editor-at-large Leslie Huffman came through with the winning post, “My Invisible Car,” which appeared on “Nothing In Particular” on April 15. And that brought Cohen’s work to the attention of CaryCitizen editor and publisher Hal Goodtree, who invited Cohen to start writing for the online newspaper. CaryCitizen.com covers news, sports, community events, and business in Cary, NC, and surrounding communities. Cohen said he’s delighted to be a part of the publication. Cohen will contribute his humor column to CaryCitizen at least once a month. To read the current column, go to www.carycitizen.com/ For more information on Cris Cohen and to read his blog, visit http://criscohen.typepad.com.